I remembered my sister always buy Ang Ku Kueh as offering to the Kitchen God. Hence I decided to prepare this dish for the Kitchen God gourmet club event. It takes time, patience, and precision to prepare these delicacies. But its worth it! Soak mung beans in water till expanded, about 3 hours. Drain, rinse and drain again. Spread beans in a shallow pan with pandan leaves, add water to just cover the beans. Steam until soft, drain. Mash beans while hot with spatula. Add sugar. Mash till dissolved and evenly mixed. Add oil. Mix till combined. Blend mixture till silky smooth. Fry in a wok over maximum heat possible, stirring constantly, till thick enough to hold its shape. Leave till cool. Divide and roll into balls weighing 20 g each. Mix the glutinous rice flour with water, cover and refrigerate overnight. Mix coconut milk in a small pot with rice flour, oil, and sugar till smooth. Cook over low heat, stirring, to make a smooth paste. Cool. Steam sweet potato until soft and mash with potato masher. Add coconut paste. Continue mashing till paste is smooth. Add wet glutinous rice flour made earlier. Knead thoroughly while adding red food coloring till evenly mixed. Add enough coloring till its a dough is evenly bright pink. Divide and roll into balls weighing 20 g each. for green pandan dough, pound 5 pandan leaves or grind them in food processor and squeeze them for green pandan juice. Knead the pandan juice into the dough. for black sesame dough, add 2 TBsp of ground black sesame seed powder to the dough. Knead the sesame powder into the dough. Lightly dust mold with rice flour. Flatten ball of dough, to about 6 cm wide. Place 1 piece of filling in the middle. Nudge and press dough to seal filling. Roll gently between palms till round, dusting lightly with rice flour if too damp. Place in mold. Press to flatten and level top, dust with flour and place a banana leaf over it. Turn over mold and whack hard against worktop so that kueh falls out, onto shiny side of banana leaf. Bring steamer to a rolling boil. 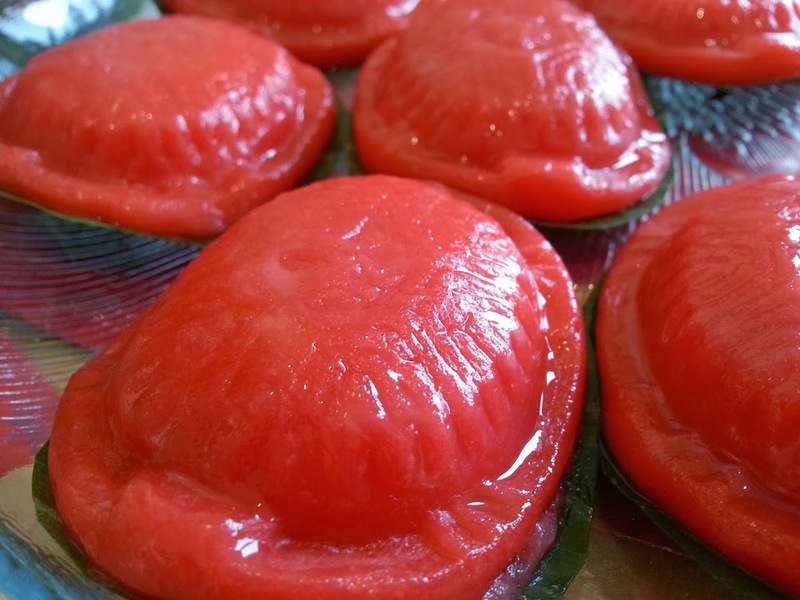 Place kueh in steamer, on a perforated tray. Cover and reduce heat to very low so that water barely simmers. Steam till kueh is slightly expanded, about 6 minutes. Remove kueh to a plate. Glaze with oil. Cool. 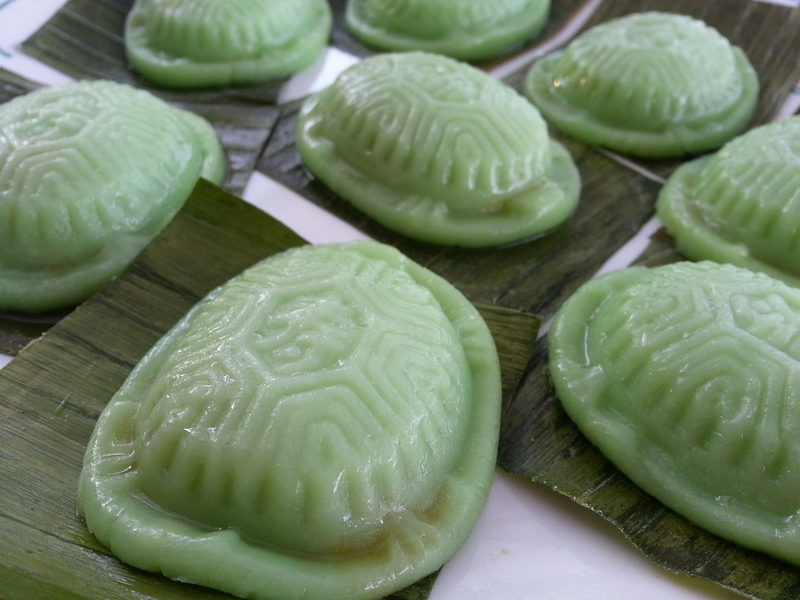 Trim excess leaf around kueh. Briefly dry fry peanuts in the wok till fragrant before chopping them in the food processor. Dry fry the sesame seeds in the wok over low-medium heat until fragrant and slightly brown. 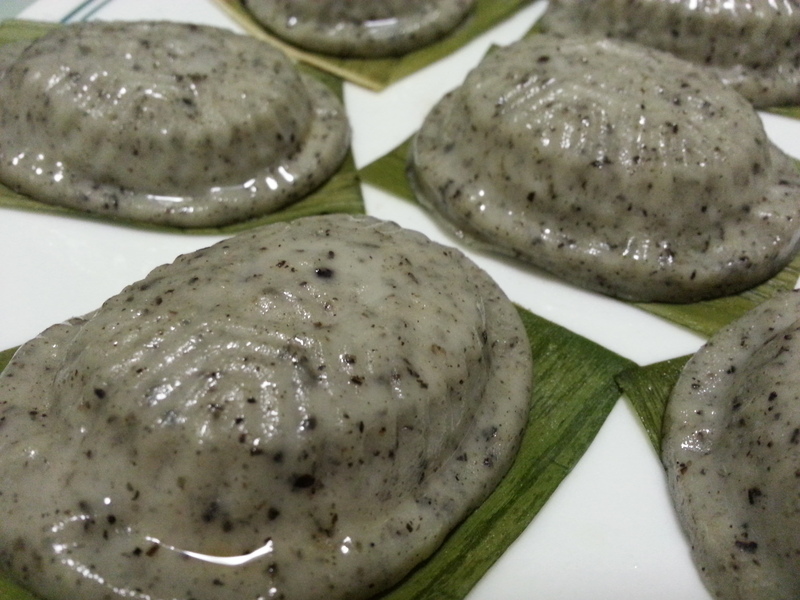 Form them into small compact balls that will suit the size of the ang ku kueh molds. Soak mung beans for 4 hours. Drain and steam the beans until soft (about 40 mins). Mash the beans while hot. Fry mashed beans till dry. Add in salt and shallot oil. Mix until well combined.